email us or call 949 510 9600 with your requirements for added discounts. Provide us with the model number(s), quantity of units and the ship to address. We will send you an estimate in PDF format to the email address provided. 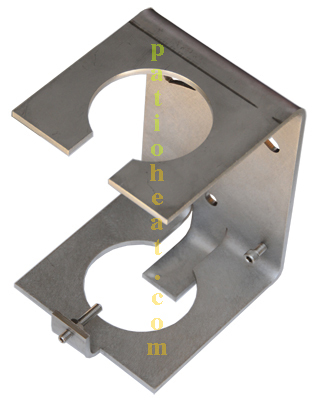 This deck mount kit was designed for the installation of a Sunglo Model PSA265 patio heater on a wooden deck. It allows the flexible use or complete removal in just under 1 min. 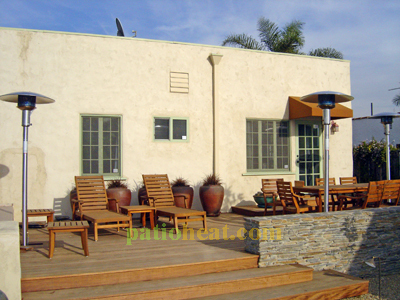 Clear your deck of the heater in summer months or in times when open spaces are required. At the ocean keep your heater protected in a storage location by removing from the harsh environment. Also ideal for mounting in Barbeque bars and outdoor countertops. Sunglo Page at patioheat.com for more product information. 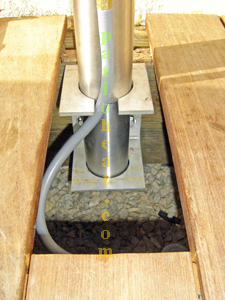 Deck Mount for Removable Natural Gas Sunglo Patio heater. Includes; 1/8" Thick 304 Grade Stainless Steel plate with 4 Lag Screws and washers. Installation Procedure: Find desired location for heater placement. Locate joist near desired location. Confirm all heater clearances will be met in this location. Remove 1 or more planks to allow for a 5" wide opening. Inspect joist for structural integrity straighten if necessary. Install Deck Mount so the plank can be replaced and rest upon top of kit. Drill Key hold in plank. Install suitable gas line to heater location. Make proper gas connection approved for portable application (see below). Install and fire test heater.